Chris Burkard is widely considered the most talented photographer working in the outdoors adventure space. He wasn’t trained as a photographer and spends much of the year living out of a car. Here’s how you can be just like him. Chris Burkard has won the Red Bull Illume photo contest, twice, has been the senior staff photographer for Surfer magazine, and to top it all off, he is a humble family man. We asked him about his life and inspiration for his career in photography. Indefinitely Wild: How would you describe what you do? 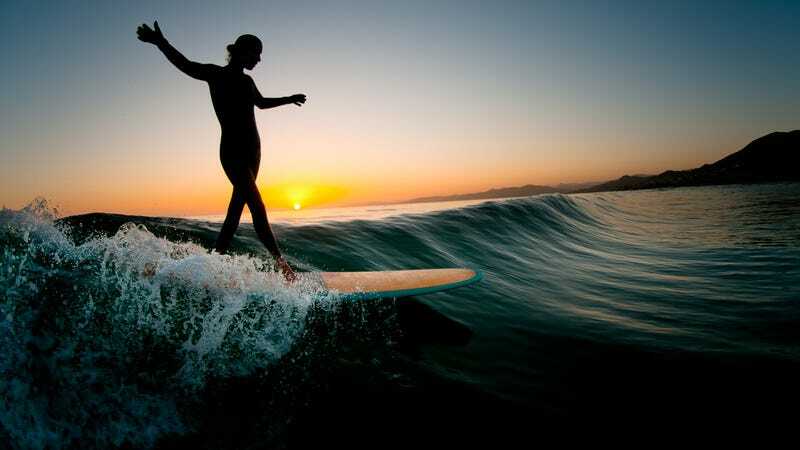 Chris Burkard: I would say it’s a mixture of outdoor and adventure sports photography. IW: With no formal education in photography, how did you get your start? CB:I started at 19, when I realized that photography could allow me to do art while traveling. I had been painting, but photography allowed me to be mobile and experience the world and create art on location. I worked really hard to get an internship at Transworld magazine. I won the Follow The Light photo contest in 2008, and used the prize money to travel for 6 months on a road trip through California to create a book called California Surf Project. I lived in my car during the week and drove back home on the weekends, so funding was initially hard. But I worked a lot and through social media, persistence, and developing my own style, things started to go forward for me. IW: When you first got into surf photography, was the community welcoming? CB: Living near the ocean, it was just natural that I turned to surf photography since it allowed me to be in the water and capture these epic moments from talented athletes at the time and even now. IW: What is it about cold water surfing that you are attracted to? CB: I am a cold water fanatic at heart. Hot beaches are always great but when you tell people you’re going surfing in Norway, Russia, or Iceland people look at you like you are crazy. And that’s the reaction that I want to get from people. Finding perfect waves in places that people would never even imagine going to surf is something that excites me and pushes me to create incredible images. IW: What was one of the biggest challenges you faced when shooting your film, The Cradle of Storms? CB: Definitely the travel was tough — riding on ATVs for 2 hours to a remote beach without knowing the conditions was a true mystery. But in the end it paid off! IW: How do nature photos benefit from having a human in them? CB: I very often try to add a human element to nature photos to create a sense of accessibility. When people see a beautiful shot of nature or an environment, they might look at it and appreciate it, but still feel alienated from it. By adding a human element, and particularly a normal human doing something basic like camping, walking, standing, or hiking. It makes people realize that people can access these places and that it’s just about getting yourself there. I hope to inspire people to get out into nature and see such places. IW: Is there something that you always look for when on a shoot? CB: I try to look for a view where a human can be, that will create a sense of accessibility while showing the beauty of the natural surrounding. Often high vantage points, or places where there is contrast or color different where the subject can still be seen. IW: Where is your favorite place to shoot, and what is it that draws you back each time? CB: Probably Iceland. It is an incredible landscape with gems just off the side of the road. So many epic waterfalls, glaciers, hot springs, and perfect surf. It’s such a rugged extreme environment that I keep finding myself going back to. IW: You are a father, and a husband, how does your family deal with your extended trips away from home? Are you able to bring them with you? CB:That is probably the hardest thing to deal with... I love to bring the family with me, but now with 2 kids and the harsh locations I am traveling to, it’s not really worth it for them. I really try to find special ways I can keep them in touch with me. FaceTime is huge, and sometimes just having a big phone bill is part of the deal. I am constantly trying to make sure they feel a part of the journey. And the most important thing is that when I am home, I am really home and involved with my family life. It’s a part of the reason I have chosen to live in central California and not a place like LA, where I can be pretty removed from work. IW: How does your relationship with God influence your work? CB: hahaha.. shoot.. Well.. God is really my center in all things. It’s only because of my relationship with the creator that I feel I have found success doing what I love for a living, and honestly, everything comes back to Him. I seek to inspire people to seek out wild places, places that I feel like God has truly made for us to enjoy, and more than anything I just want people to see His hand in all things. IW: You’ve published a few photo books before, but with your new children’s book, The Boy Who Spoke to the Earth, fully funded on Kickstarter, can we expect more like this from you in the future? CB: I hope so. I’m incredibly happy with the result and the response from all the people who contributed to make it happen. IW: Are you a one man show, or do you have employees that help you along the way? CB: I have an in-house studio team that helps me with assisting and digi-teching on shoot, and the business side of things back at the studio. IW: Describe your kit that you use on your outings. CB: I use the Sony A7II, an A7S, a variety of lenses that range from 10-18, 16-35, 24-70, and 100-300. A lightweight tripod, rain gear, some food, and camping gear. If there’s not access to electricity I’ll take Goal Zero to keep things charged. IW: Why the Sony A7 system? CB: Sony A7II because it’s super lightweight and allows me to be mobile. I’m really happy with the dynamic range, and having such a small camera means I can have a more intimate interaction with what I’m photographing. IW: What has the new Sony A7S enabled you to do that you would otherwise not be able to do? CB: The Sony A7S allows me to shoot low light scenes with incredible flexibility. The sensor lets me shoot with a higher ISO and have less noise than any other camera I’ve held. My best photo example is the Spirit Island shot at night. Crisp clean stars with very little noise. IW: What advice do you have for budding Chris Burkards? CB: Remember that the camera is just a tool. What truly matter is how you see the world and translate that through your photography. Follow your passions and do what you love. Be good to people and nature, your passion will eventually support you. Try to create your own niche and style while being inspired by others. Be open and honest, and don’t give up on your dreams. Chris is opening a new gallery in Avila Beach (near Pismo) in the near future. His instagram feed is riddle with daily inspiration and generous mind surfing sessions, check it out! He is also a class act who has always taken the time to chat with me about photography and surfing.